Sweeping views of London are served up on a silver platter at Jin Bo Law. As the saying goes, when one door closes, another one opens. London lost two big hitters in recent months: Kensington Roof Gardens and Brixton Beach. And although this was devastating for rooftop revellers, Jin Bo Law came sweeping in to save the day. Offering pristine views of the City and a collection of unique cocktails, here’s how my rooftop experience went. You’ll find Duck and Waffle on the 40th floor of Heron Tower, and yes, it has glorious views of London, but Jin Bo Law is here to prove that it’s not all about how many floors you are above ground level. 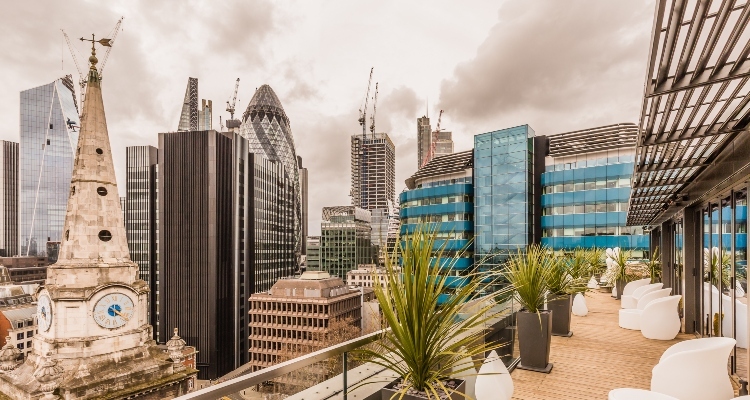 Residing on the 14th floor of the Dorsett City Hotel in Aldgate, you can set your sights on iconic buildings and landmarks like Tower Bridge, the Shard, the Walkie Talkie and the Gherkin, without as much as moving a muscle. Wooden decking, potted plants and white chairs with plump orange cushions decorate the intimate terrace, and if you’re determined to watch the sunset (like we were), there are outdoor heaters to prevent chattering teeth and goose pimples. Leaving the views from the terrace to do all the talking, you’ll get a better feel for Jin Bo Law’s personality indoors. Carrying plenty of Asian influences, it’s a luxurious den with a marble topped bar and floor, diamond-shaped aesthetics and floor-to-ceiling windows that open up, so you can still lose yourself in the surrounding sights inside. Mustard-coloured chairs line the length of the bar and are dotted at tall mahogany tables, and further back you’ll find a boxed-off space with a rustic red chesterfield sofa, a table built with vintage books and funky feature lighting. 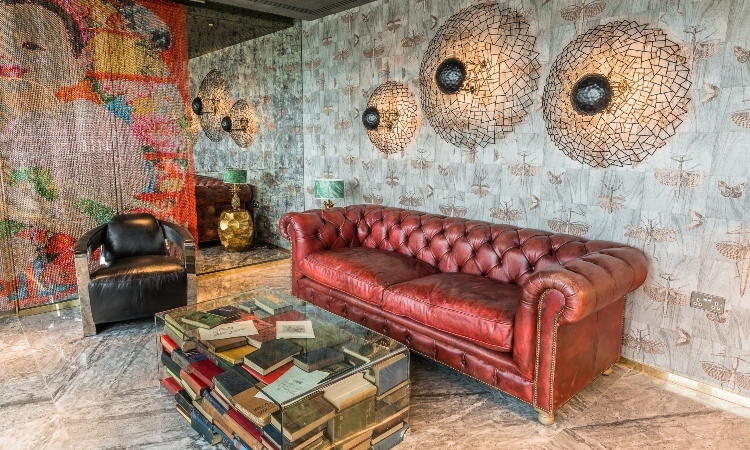 Jin Bo Law shows off its Asian influences with quirky interiors and bright colours. Focusing all of our energy on the cocktail section of Jin Bo Law’s menu, it was interesting to see that it had been condensed down to a list of eight mixes. Shunning anything with the mention of Chartreuse due to an unfortunate incident at the back of an abandoned lorry as a teenager, our waiter convinced me to give it another chance by ordering the Peas of Mind (£12). 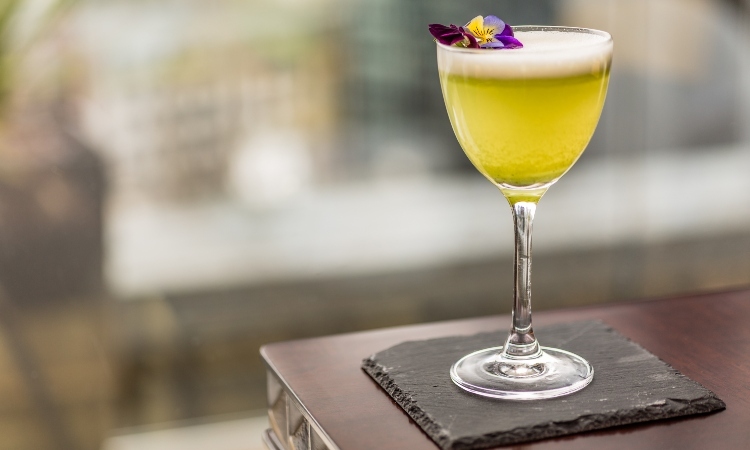 Made with Korea’s most popular soju, Jinro Soju - which is usually drunk neat - it was mixed with yellow Chartreuse, yuzu, egg white, salted pea cordial and pea powder. Refreshingly light and perfect sipping for a summer’s day, I was pleasantly surprised by the flavours. The egg white balanced out the unique combination, and the yellow Chartreuse complimented the main body of the spirit. My friend ordered the Butterfly Punch (£12), which married Absolut Elyx vodka, silver needle jasmine tea, orange blossom honey and squeeze of lemon juice. Floral with sweet notes, it wasn’t long until the last drop was drained. My second and last drink of the night was the Spice to Mead You (£12). Made with my all time favourite spirit, gin, a generous measure of Mother’s Ruin married five spice honey mead, lemon, and Chinese cherry apple. Tart and to the point, it didn’t definitely disappoint my dehydrated palette. Peas of Mind has the summer stamp of approval (even if it is made with yellow Chartreuse). Jin Bo Law might not have a beach to its name, or roaming resident flamingos, but they’ve come onto London’s rooftop scene with their own concept and voice. Different to any other rooftop in the City, they offer up views of London on a silver platter and they have a range of cocktails with unusual ingredients that are sure to grab your attention.